Your bathroom should feel like a sanctuary—a place where you can get ready for the day or simply wash its troubles all away. The last thing you want when you’re brushing your teeth or washing your hands is to use a bathroom sink or faucet that has been stained green. This is a more common problem than you might realize. Many people notice that their sink, fixtures, and faucets develop green discolorations over time. There are a few different reasons as to why this might happen. Though some are relatively easy to fix, others require the help of a professional. Moist environments provide the perfect conditions for mold growth. As you can imagine, mold can grow and thrive on the wet surfaces of your sink and faucet. Steam from showers, water spills, and consistently humid conditions allow mold to grow on and around your sink, turning it green. If you begin to notice mold turning your bathroom sink, faucet, or drain green, you need to remedy the problem immediately. Exposure to mold can pose serious health issues. There is good news, however. If dealt with quickly, mold can be eliminated fairly easily. Clean the sink, the faucet, and other impacted areas with a mold removing household cleaner. These cleaners can be purchased at local hardware stores, supermarkets, and other retailers where household cleaning supplies are sold. Use rubber gloves and be sure to properly ventilate the bathroom when cleaning. After use, make sure you don’t leave stagnant water and other sources of lingering moisture where mold can begin to grow again. It’s also a good idea to use the cleaner every few days to ensure the mold doesn’t come back. Believe it or not, your water may be turning your sink or faucet green. If your water is highly chlorinated or overly acidic, it can cause green stains in your sink. In this case, you can purchase a water testing kit to determine the pH balance of your water and what other contaminants may reside in it. If your water is staining your sink, you may need to add, repair, or replace your water filtration system. Copper or brass faucets and fixtures have the potential to turn your bathroom sink green. Oxidation and corruption can cause copper to develop a patina—that’s why old pennies turn green. Moisture, time, and wear can erode the protective coating on brass and copper fixtures giving them a green discoloration. If your fixtures begin to develop a patina, it’s actually quite easy to clean. Simply clean the faucet, drain, taps, and other affected areas with white vinegar. Of course, once the oxidation process has begun, you need to either constantly clean the fixtures with a white vinegar solution or re-coat the fixtures to eliminate further development of green discoloration. The plumbing in older homes is often made up of copper piping. 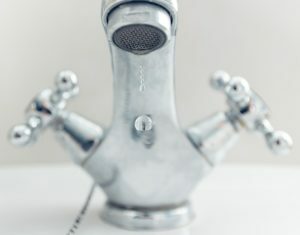 If water drips and accumulates in your sink and these locations begin to develop a green discoloration, it is most likely due to copper pipe erosion. When copper pipes erode due to age, high levels of minerals in the water, or overly acidic water, it can cause your sink to develop a green hue. This is not only unsightly, it can even be hazardous to your health. 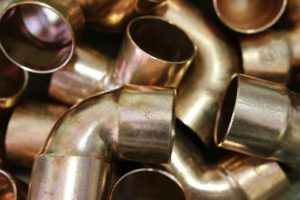 Copper pipes are often soldered with lead, and the longer copper pipes are allowed to erode, the greater your chances are for lead contamination. If you suspect that the green discoloration in your sink or on your faucets is due to copper pipe erosion, you should contact a plumbing professional immediately to assess the situation and discuss remediation. The last thing you want when you’re brushing your teeth or washing your hands is to use a bathroom sink or faucet that has been stained green. This entry was posted in Home Improvement and tagged Bathroom Sink, Contractor License Resource Group, Copper Pipe Erosion, Copper Pipes, Formation of Mold, Mold Growth, Oxidation Process, Sink and Faucet. Bookmark the permalink.